Each handle comes with a 5 year coating guarantee! 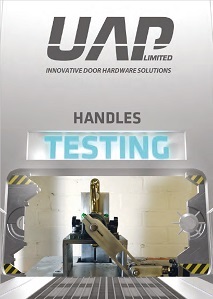 Designed for comfort and ease of operation, the UAP Pad front door handle has a 243mm long backplate, offering a high quality designed front door handle. Each front door handle has a pad shaped external handle. Handles are non-handed and can be used as either a left or right hand, allowing it to fit a range of profiles. 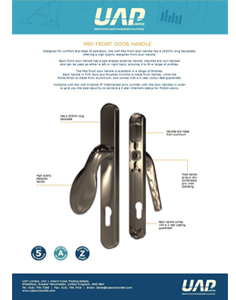 The Pad front door handle is available in a range of finishes. Each handle in PVD Gold and Polished Chrome is made from Zamak, while the White finish is made from Aluminium, and comes with a 5 year colour fast guarantee. 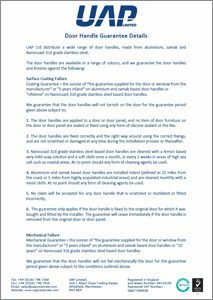 Combine with the UAP Kinetica 3* Kitemarked euro cylinder with the door handles in order to give you the best security to achieve a 3 star Kitemark status for PAS24 doors.